The more features you add to Emacs, the more keybindings and commands you have at your fingertips. To manage all this power, Spacemacs uses which-key to organise these keybindings and commands into groups. You can still use all the keybindings that come with Emacs packages as well as type in command names using M-x command-name too, or SPC SPC command-name, if you know the the command-name you are looking for. You can navigate around the which-key menu system using commands under C-h. This allows you to go back to a parent menu if you selected the wrong sub-menu. 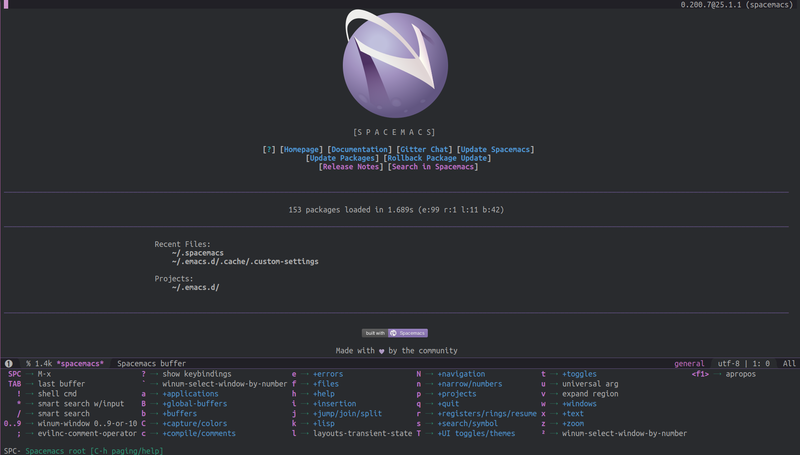 Depending on the number of items on a particular menu and the size of your Spacemacs frame, the menu may be spanned over several pages of menu. So pressing C-h n will take you to the next page of the menu, while C-h p will take you to the previous menu page.